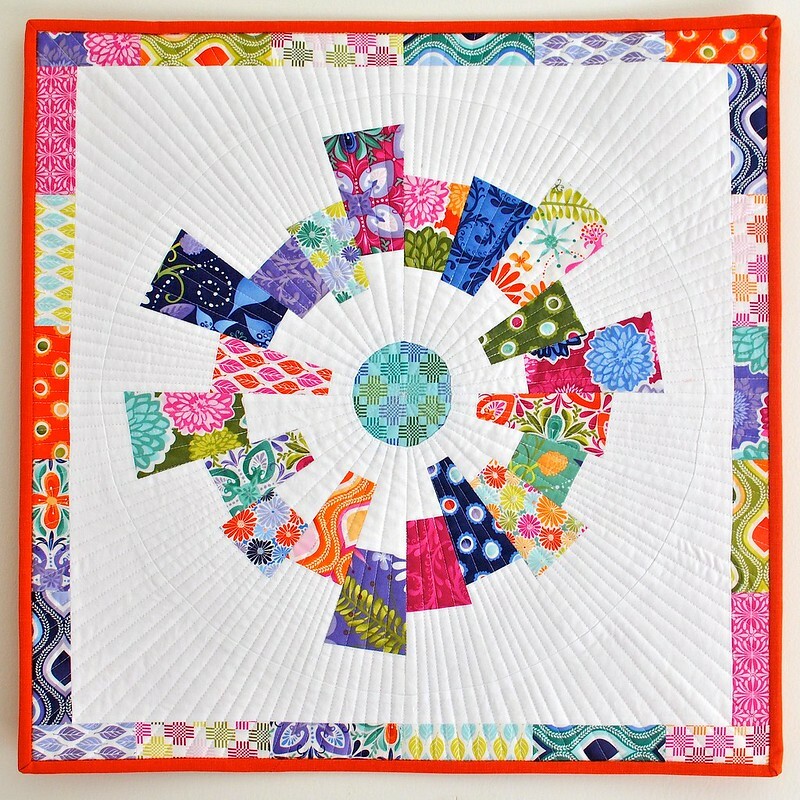 The Salt Lake Modern Quilt Guild is hosting a challenge using a dresden ruler. Over the summer when the challenge was first announced, I had a few ideas pop into my head. As I played with the ruler and the shapes that it creates, my ideas evolved a bit until I came up with these two quilts. The first quilt is a mini, measuring 23" square. 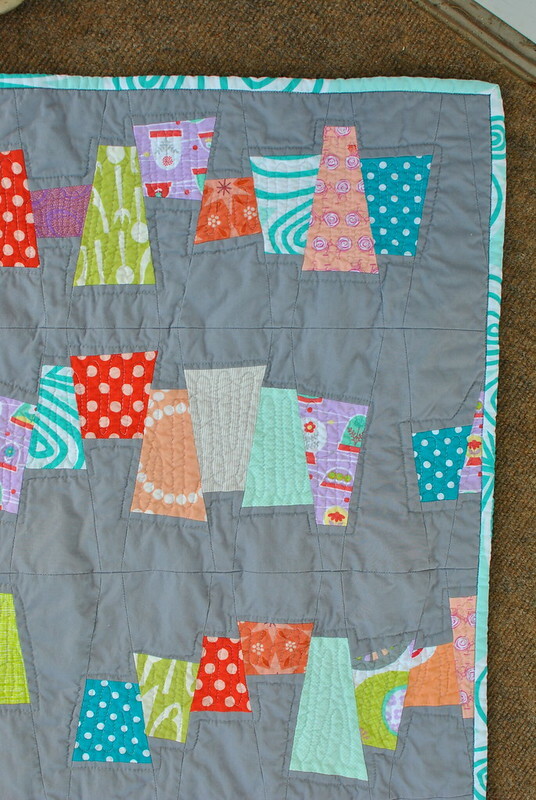 I love using one large block to create a mini quilt - it's the perfect size to display on the wall! I reverse appliqued the center circle and pieced the outer seam on the "dresden plate". I can't lie, I held my breathe the whole time I was sewing the outer circle seam! 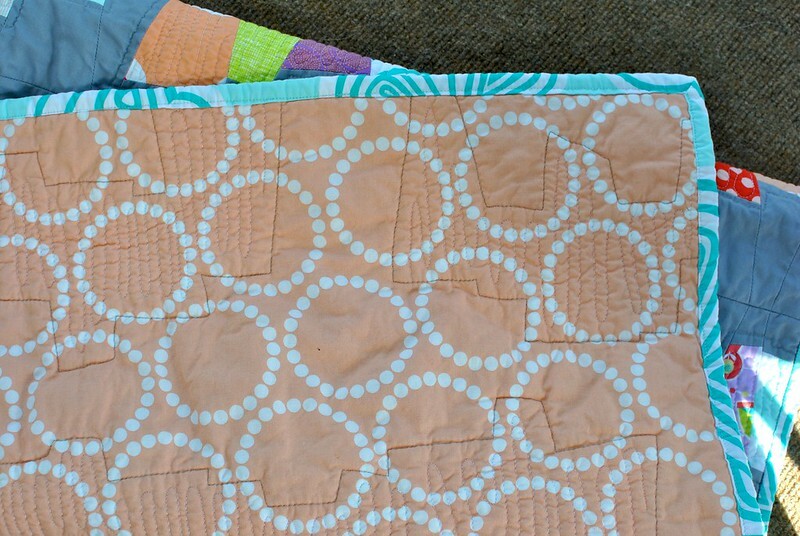 The quilting is simple straight lines that increase in density from the center of the quilt outward. 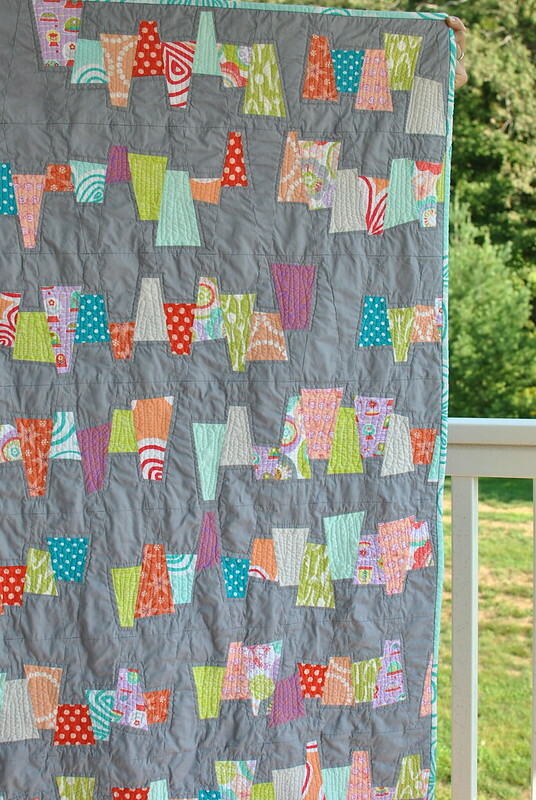 I used a charm pack of Kate Spain's Terrain for the quilt top. 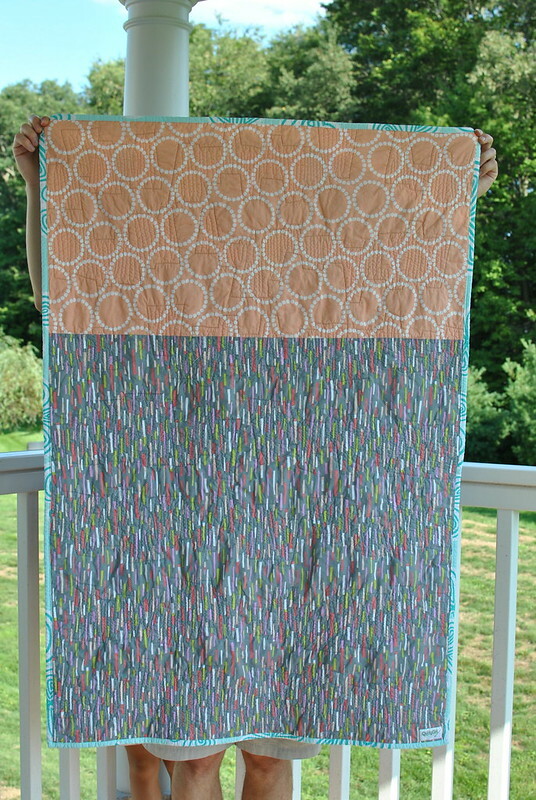 The backing is a great polka dot: Dumb Dot by Michael Miller in Tangerine. 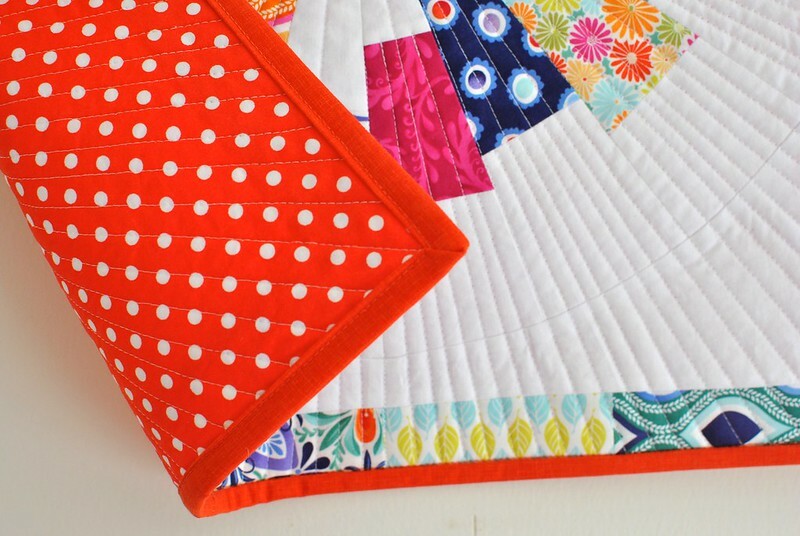 The binding is Quilter's Linen by Robert Kaufman in Orange. My second entry is for the Innovative category. The idea for this quilt came along because I love the look of wonky piecing, but I don't enjoy the process because I always seem to generate a lot of fabric waste! I'm often thinking up different techniques to accomplish the look I like, but which also satisfy my Type A personality! 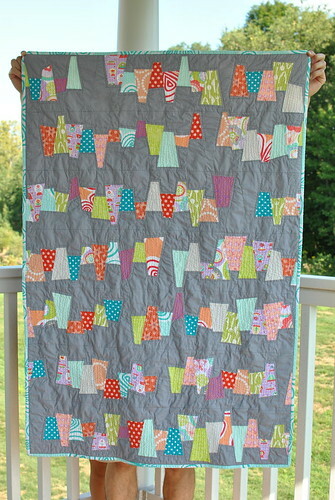 And so I used that as inspiration for this quilt! To achieve this design, I cut strips of my prints at random angles using a rotary cutter and ruler to keep my cuts sharp rather than curved. Next I pieced a strip of grey to either side of the print, and then cut my dresden pieces from the pieced fabric. The entire quilt top is made up of dresden plate pieces! I quilted the rows of wonky wedges in a linear zig zag style and then quilted around each row of wedges to further accent them. The traditional quilter inside of me can't believe that I left the negative space unquilted (I was taught to quilt a piece with uniform density throughout! 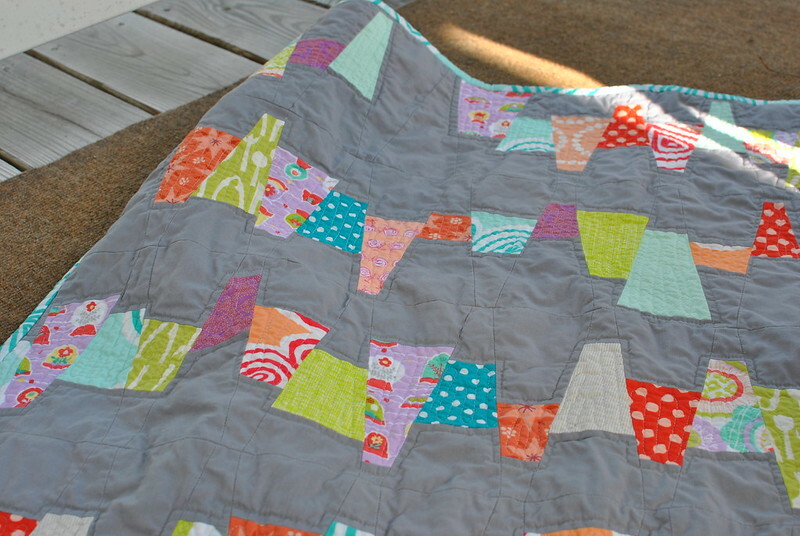 ), but it gives the quilt a softness while not distracting from the wonky wedges. For the back I used a large piece of my inspiration fabric plus a chunk of coordinating print. I love that the quilting is obvious in the light print of the quilt back, yet it blends right into the dark print! This quilt finished at 36" x 52". 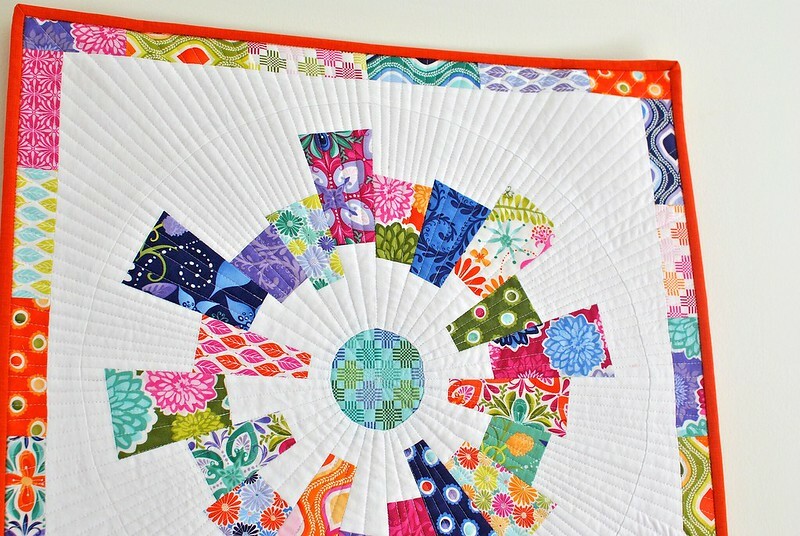 I love this mix of prints, so I may make a me-size quilt soon! Link ups are open from Sept. 1-6. I can't wait to see all of the beautiful creates! It's only day 1 and there are already lots of inspiring projects out there!